Will I be drinking this again: I have another bottle in the basement, it was a little hot so hopefully some age will tame it a bit. 3/22/2011: Let it be known that I will try any beer that has maple in it. I LOVE maple flavor. It also helps that they use yams in this because sweet potatoes/yams are right up my alley as well. You might see a blurry face in the reflection of the window behind the beer, and that would be my good friend Donnie who I split the beer with. I was expecting a lot of maple in the nose, but there was zero. Lots of spice, nutmeg and cinnamon maybe? Also something fruity. The flavor is great, but not what I was expecting. Cinnamon, nutmeg and clove are the front runners. Maple is there but to be honest I’m not sure if I would have picked it out if i had not known it was in the beer. Lots of caramel flavor as well. Everything about this beer is great except for the mouthfeel, and strong alcohol bite. The mouthfeel is a bit light for such a high ABV. Overall though I’ll bet this beer will be great with some age. Picture of the day: I can already tell this chick is going to make a great mother. Purchased at: Sent as winnings in a superbowl block poll. What makes this beer different: The first aged barleywine I have ever tried, and it definitely mellows out the harshness. 1/4/2011: Almost a year ago I registered in a superbowl block poll on BeerAdvocate with 9 other people. It was the first time I tried anything like this, but I ended up winning. The losers all had to send at least 48oz of beer to the winner, but most sent more. That was a total of at least 432 oz of beer, or 36 12oz bottles. I got a ton of good rare stuff like the beer above, a 2006 Bourbon County stout, and others. I’m definitely going to register for this again this coming year. The nose is semi-boozy, caramel, some spice, and some citrus as well. There are a ton of flavors going on here, and surprisingly hops are one of the dominant ones even after 2 years of age. To be honest if this was fresh the hops might have been a bit overwhelming. Sweet caramel malt, bitter citrus hops, and a nice bite from the alcohol. A bit of a orchard fruit type kick that I really can’t put my finger on. About average on the mouth-feel, but has a very long finish. One of the better American Barleywine’s I have had. 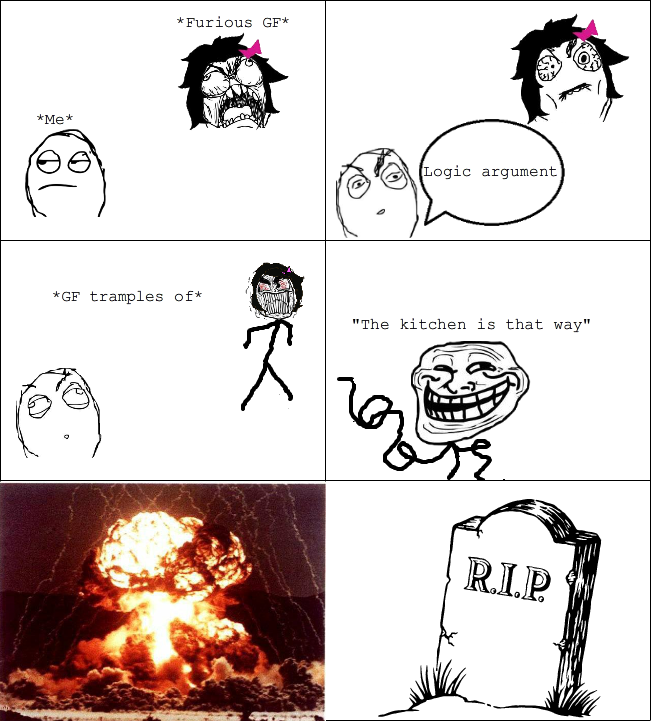 Picture of the day: Never use logic to argue with a girl. What makes this beer different: Not too much but its good, I’m starting to realize that hefe’s are a style that does not have a wide range of nuances. Will I be drinking this again: At $1.59 for a bottle, hell yes. 8/12/2010: Thanks to reader Jordon for suggesting this beer to me. Like many of the summer beers out there I have seen this one on the shelves many times, but never had a reason to really buy it. I figured it was fitting that I drink a hefe on a day when I’m taking a stab at my second homebrew, a franzy clone with 3/4lb of honey malt added in for my own little spin on it. Kellerweis is the first wheat beer I have tried from Sierra Nevada. The nose was typical for a hefe; wheaty and a bit of banana. The flavor is also very typical for the style, but very well done; fresh grainy wheat, with an even dose of banana/clove. The mouthfeel is a little on the full side for a hefe, but I like it. Overall nothing really stands out all that much about this beer, but thats why its an A- as its a great example of a well brewed hefe. I don’t think they didn’t mess with the standard recipe too much and it came out very good. 7/18/2010: Anderson Valley Winter Solstice is one of my favorite Winter Warmers, so I assumed that the Summer Solstice would be of similar quality. The fact that Anderson Valley started canning their beer also made me go out of my way to purchase this. Summer Solstice actually pours out and looks very similar to the Winter Solstice. The nose reminds me of those little butterscotch candies. The flavor, again reminds me of the Winter Solstice, but less carbonated. Sweet brown sugar, caramel, butterscotch, and little to no hops in the brew. What really killed this beer for me was that there was not very much carbonation going on at all. I might have enjoyed this beer a bit more if it were a cold winter night, but I drank this on a hot humid summer day. Not very refreshing. Picture of the day: A few hilarious pranks.